The topic of social media is becoming increasingly popular, as shown in the Google Trends chart below. From the outside looking in you might say that social media is the “cool guy” at the digital marketing party. I have chosen to pick on social media strategists for this very reason. However, my point is relevant to all marketers. Every business should have a macro goal established for its website. This goal should be your primary business objective, such as generating revenue or sales leads. It’s what affects the bottom line of your company. Social media strategists usually focus heavily on micro goals such as the number of followers or likes on a post, as they should. However, is their strategy working towards completing the macro goal? Of course acquiring a larger audience and aiming for higher engagement rates is vital to the success of any social media strategy. I’m not denying the foundation of social media. Rather, I’m suggesting a shift in perspective. It’s easy to forget that a social account for a business has an entirely different purpose than a personal account. Your social media strategy should reflect that. If your strategy isn’t ultimately designed to achieve your macro goal, then you’re not seeing the big picture. This causes your social strategy to miss opportunities to contribute to your business’s bottom line. Moreover, if your company is tracking their goals with a web analytics service such as Google Analytics, then your contribution to the macro goal via social media is measurable. Will the numbers make your strategy look effective, or useless? Below is a simple example of how Target interacted with its audience, provided useful information, and directed followers to target.com to complete the macro goal (sales/revenue) all in one tweet. Their social strategist sees the big picture. 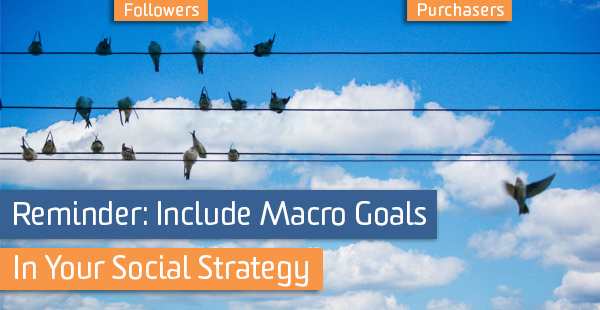 Your social media strategy can support both your micro and macro goals at the same time! Review your business’s social media strategy with a new perspective and your macro goal in mind. Make some changes and if your numbers improve you just might get a raise!